Black Holes Supermassive - Solar System Planets And Moons Section. Supermassive Black holes Early On. large Galaxies have a supermassive black hole at their centre. Astronomers now believe that all large Galaxies have a supermassive black hole at their centre, but it was believed that these black holes formed after the galaxy. The evidence is starting to point the other way, that these black holes formed soon after the Big Bang, and then the Galaxies built up around them. 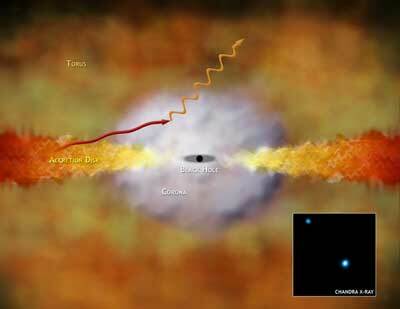 New observations from the Chandra X-Ray Observatory show a distant quasar that formed less than a billion years after the Big Bang, and was already producing the same amount of energy as twenty trillion Suns.